Audiocassette tape recorders are widely used to record and play back music or speech. Information is stored on a narrow ribbon of plastic tape that has one side coated with a magnetic material consisting of magnetically active particles, most commonly iron oxide and chromium dioxide. 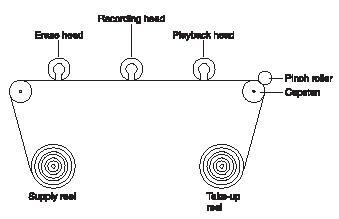 As the tape passes around the five magnetic heads of a tape recorder, sound is recorded, replayed, or erased according to the heads that are activated. incoming sounds. The resulting pattern remains on the tape until erased or changed. The tape of an audiocassette has a weak magnetic field (an area where a magnetic force is present) around it that varies from point to point depending on the pattern of its magnetic particles. The playback head contains a coil of wire. When the magnetized tape moves past the coil, an electrical current is created. The current will alternate in direction depending on the alignment of the magnetic particles as they pass by the playback head. The magnetic pattern originally recorded on the tape is transformed into a precisely corresponding electrical signal. The electric current from the playback head is then amplified and sent to an audio speaker, which vibrates simultaneously with the varying current. The back-and-forth motion of the speaker creates pressure waves in the air. This causes the listener's eardrums to vibrate, producing the sensation of sound. Digital audio tape (DAT): A technology developed in the 1990s, by which information is stored on magnetic tape in binary code. Electromagnet: A coil of wire surrounding an iron core that becomes magnetized when electric current flows through the wire. Erase head: An electromagnet operating at an ultrasonic frequency (rate of vibration) to scramble previously recorded information on a tape. Playback head: A small coil that senses the varying magnetic field of the moving tape and converts it into an electrical signal that can be amplified. 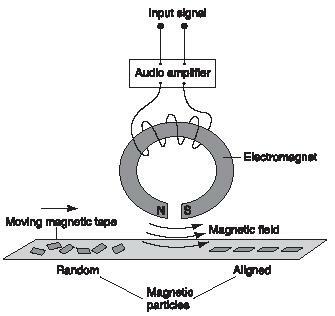 Recording head: An electromagnet that aligns the magnetic particles of the cassette tape while it moves by. An audiocassette has a built-in erase head to remove previously recorded information. The tape has to be blank before it can be used again to make a new recording. The erase head normally is an electromagnet that operates at an ultrasonic frequency, much higher than the human ear can hear. It effectively scrambles the previously recorded magnetic particle patterns. Audiocassettes are designed so that the tape from the supply reel passes by the erase head just before the recording head. The invention of magnetic recording tape is attributed to both American inventor J. A. O'Neill and German engineer Fritz Pfleumer (1881–1945). Pfleumer filed the first audiotape patent in 1929. In 1935, the German electronics firm AEG produced a prototype (first version) of a record/playback machine, called a magnetophon. It was based on Pfleumer's idea, but used a plastic tape. Another firm, BASF, went on to refine the tape AEG used, presenting the first usable magnetic tape in 1935. At one time, audiotape was used in a reel-to-reel format. This was a complicated and awkward procedure. Eight-track cartridges were another innovation in magnetic recording. These used an endless-loop format so the tape could be played continuously without being flipped over by the listener. The audiocassette was introduced in 1963 by the Philips Company of the Netherlands. The audiocassette made inserting, advancing, and rewinding a tape fast and easy. The tape could be stopped and ejected at any point. Because of this ease and economy, magnetic tape recordings could compete with long-playing records (LPs). The invention of the microchip allowed audiotape players to be made smaller and more portable. With the introduction of products such as Sony's compact Walkman™, cassettes became universally popular. (DAT) recorders became widely available in the United States in 1990. A digital system enables a home recorder to make a tape copy that is an exact replica (not just an approximation) of the original sounds on a cassette that is half the size of a typical audiocassette. Digital technology records sound in a code of binary numbers (a series of zeroes and ones), so each subsequent recording is an exact copy of the code. These kinds of recordings do not suffer from the sound distortion that was the problem with the recordings they replaced. It's a good article. Very interesting. Martín, from Mexico.